Of these, which do you think is the most evil aspect of Apple? The abandonment of 1960's idealism. The money they spend on lawyers. Shipping computers with just 256 megs of RAM. They ask us to Think Different... that's gotta be evil! The horns and cloven hooves they hand out to all new employees. 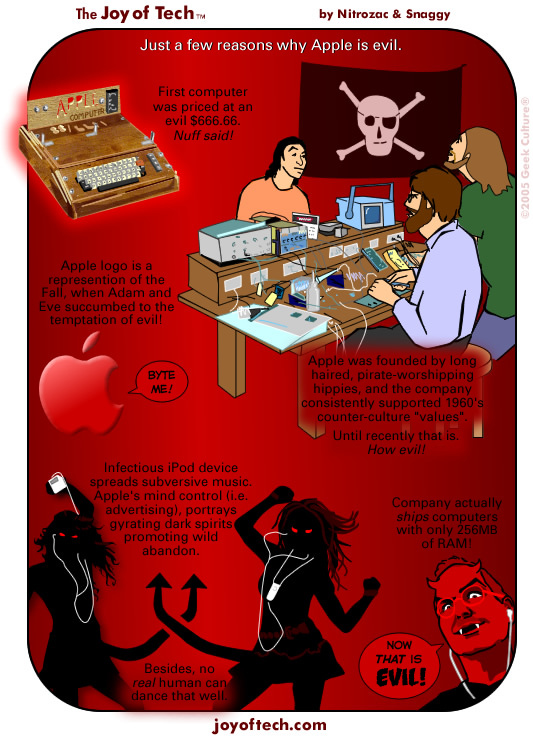 Thinking that Apple is evil is EVIL! musicbunnydancing starts 100 Reasons Geek Guys are Hot!, ... Orpheus is looking for a new Watch, ... quantumfluff eats up Spamalot , ... bageria seeks help identifying an old TV show, .. n4dmx needs Programming ideas , ... Tom-geeking around needs advice talking/chatting, ... and californiarockr wants you to post pics of you and your SO. And in SuperFan Clubhouse Tidbits: Doco is revealed!